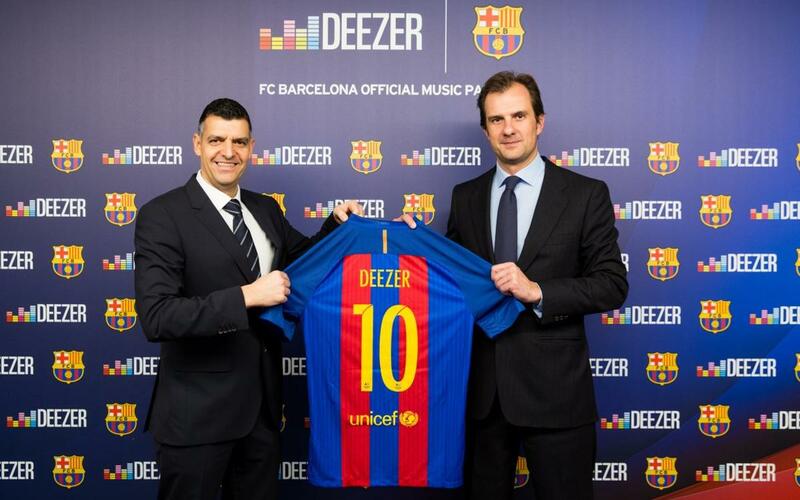 Today at the Camp Nou, FC Barcelona and Deezer, one of the world’s leading music official platforms, announced a new strategic partnership which sees the music streaming site become the Club’s Official Music Partner. As a result of this global partnership, Deezer will be offering its users The Sound of Barça, the Club’s official music channel, containing official playlists both of FC Barcelona and of different Barça footballers and other athletes. Deezer, as FC Barcelona’s Official Music Partner, will provide over 100 songs for music and football fans that represent the best of the Club, including top hits and Catalan songs, as well as the tracks that help players get in their pre-match Flow. Users will also have access to Deezer Flow, a personalized soundtrack, based on an unique algorithm and in-house editor, to create a stream that mixes personalized recommendations. Deezer subscribers will be able to enter competitions to win FC Barcelona themed prizes, while Barça fans and members will get the chance to win a Premium account for the site, which offers access to an unlimited music library. “From today, and via Deezer, FC Barcelona has a new channel to reach its followers all around the world through music. They will all be able to enjoy The Sound of Barça, the Club’s official music channel, and will able to enjoy a selection of representative songs of FC Barcelona as well as those of their favourite sportspeople. The partnership with this worldwide music streaming platform consolidates the Club’s project to globalise and innovate”. “We are delighted to be partnering with one of the world’s leading football teams, FC Barcelona, as the club’s official music streaming service. Not only will the partnership allow us to give football and music fans a more personal way of accessing exclusive content, but it will bring both sets of fans much closer to one of the world’s most popular sports - football. Be it creating personal soundtracks through Deezer’s signature feature Flow, or creating and sharing player playlists, we are very much looking forward to what the future holds”.